Clover is using Smore newsletters to spread the word online. Whenever you hear the word 'hero' you think of Batman, Spiderman, and many more right?Well you are correct about them, but there are more than just steriotypical heros. For example, everyday citizens and, Odysseus,who has many heroic qualities. He was physical characteristics , mental characteristics, social characteristics, and moral characteristics. 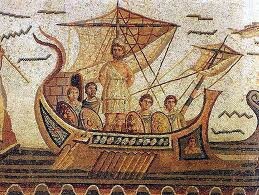 What are the heroic qualities in Odysseus? Smart. Because he told the giant that his name was 'Nobody'. "... My name is Nobody. Nobody, my father, mother, and friends call me." Prepared. Because he took what the king offered him because he had an instinct that something would happen. "... since my instinct told me the giant would come at us quickly, a savage being with huge strength, knowing nothing of right or law." Courageous. Because he planned to kill the giant. "Then I formed a courageous plan to steal up to him, draw my sharp sword, and feeling for the place where the midriff supports the liver, and stab him there." Encouraging. Because he makes his crew feel like they will be safe. "The rest of you loyal friends stay here, while I and my crew take ship and try to find out who these men are..."